The Investec Multi-Asset Protector Fund 2, aims to provide attractive long-term returns, with the added benefit of downside protection. Flexible access.The Fund is daily priced and daily dealing, and eligible for investment through ISA and pension plans. Attractive for a wide range of investors. Could be suitable for investors seeking lower volatility growth with added downside protection to use within a drawdown retirement plan. More cautious investors who are particularly worried about market volatility and potential losses. Investors looking for lower volatility growth with added downside protection, aiming to provide sustainable, long-term income during retirement. The dynamic nature of the downside protection means that the Fund may lag the market in times of rapid market recovery, because the Fund may be largely invested in cash for extended periods of time. Large investments in cash will mean that upside may be limited if markets subsequently rise. As a result, keeping the Fund open may no longer be in the best interest of shareholders and at this stage, the Manager could consider winding up the Fund. Investec’s Multi-Asset Protector strategy is available in two Funds which are managed in the same way but could have different portfolios and protection levels due to their different launch dates. Currency exchange: Changes in the relative values of different currencies may adversely affect the value of investments and any related income. Derivative counterparty: A counterparty to a derivative transaction may fail to meet its obligations thereby leading to financial loss. Derivatives: The use of derivatives is not intended to increase the overall level of risk. However, the use of derivatives may still lead to large changes in value and includes the potential for large financial loss. Equity investment: The value of equities (e.g. shares) and equity-related investments may vary according to company profits and future prospects as well as more general market factors. In the event of a company default (e.g. bankruptcy), the owners of their equity rank last in terms of any financial payment from that company. Fund closure: Where the Fund is unable to find a suitable counterparty to enable at least 80% of the value of the Fund to be protected or where only allocation to cash is feasible, the Fund may have to be closed with the proceeds returned to investors. Government securities exposure: The portfolio may invest more than 35% of its assets in government securities issued or guaranteed by a permitted single state. Interest rate: The value of fixed income investments (e.g. bonds) tends to decrease when interest rates and/or inflation rises. Large cash holding: There is a risk that the Fund may hold large proportions of cash for considerable periods of time. This may lead to the Fund underperforming those markets where it is usually expected to invest. 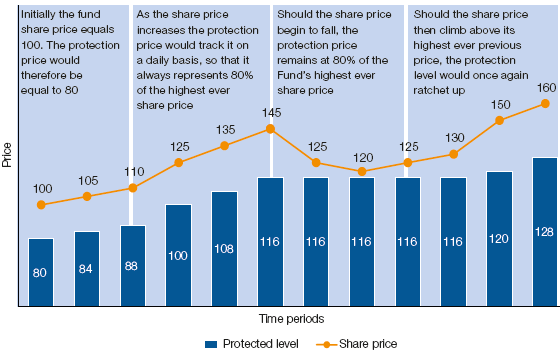 Protected value: Whilst the Fund will endeavour to protect at least 80% of its value at all times this is not guaranteed.